1. Forest fragmentation affects many ecosystem processes by spatially altering relationships among organisms. Herbivory by arthropods is an important ecosystem processes in forests that fragmentation alters by changing relationships among herbivores, their predators, and their hosts. The relative importance of these factors remains unclear. 2. 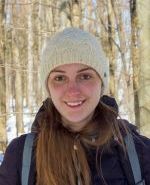 It was tested whether the exclusion of vertebrate predators affected the arthropod abundance or amounts of herbivory in a fragmented, deciduous forest landscape in southern Quebec. Differences in the abundance of arthropod herbivores and amounts of herbivory in forest patches with different landscape characteristics (small isolated patches versus large connected ones), on sugar maple saplings with or without exclosures that restricted access by large vertebrate predators were measured. 3. Saplings protected from predators with exclosures had greater abundances of all arthropods (herbivores and invertebrate predators) than those without, indicating potential top-down effects of vertebrate predators on arthropods. Analysis of effect sizes between exclosure treatments and controls suggests the magnitude of predation effects may be affected by fragmentation. 4. Strong top-down effects of predators on arthropods, and weak effects of fragmentation on predation or amounts of herbivory were found. As a result, herbivory may be regulated by factors other than vertebrate predation in this system.